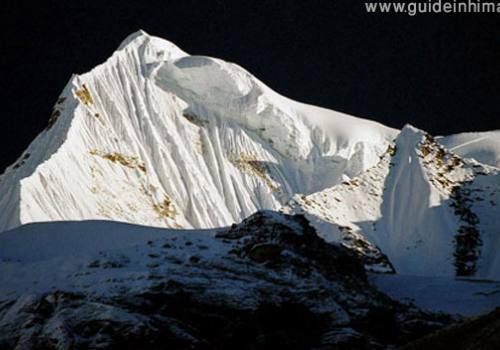 Island Peak also known as Imja Tse, 6189 meter high, one of the most frequently climbed peaks in the Everest Region. It is easy access to the Island Peak regularly combined with the ascents of other nearby trekking peaks such as Mera Peak, Pokalde, and Labuche East. The name Island Peak is given by Eric Shipton´s party in 1951 because it appears as an island in a sea of ice when viewed from Dingboche. The peak was afterward renamed in 1983 to Imja Tse but Island Peak remained the well-liked choice. Actually, the peak is an extension of the ridge coming down off the south end of Lhotse Shar. 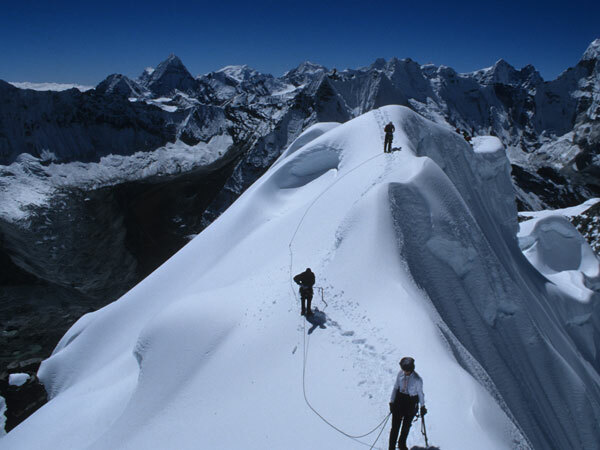 Island peak is labeled “Trekking Peak” and originally applied by the Nepalese authorities to mountains that were felt to be accessible without the logistics of a major expedition and didn’t require an extensive knowledge of winter alpine skills. Although the majority of these peaks can be climbed in just one or two days from a trailhead, their technical difficulties and objective dangers vary enormously. Whilst climbing a “trekking peak” is not as challenging as an 8000m summit, these mountains should not be taken lightly: a considerable amount of time often needs to be spent above 5000m, often in difficult weather, on slopes that need a good range of mountaineering skills. Island Peak was first climbed by a team of mountaineers that included Tensing Norgay and Edmund Hillary, as preparation and acclimatization for the first ascent of Everest in 1953. 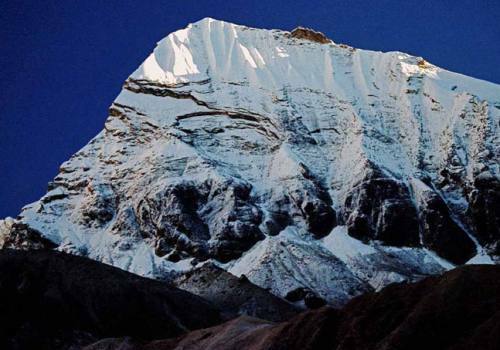 For Island Peak Expedition, one has the option of starting from a base camp at 5,087 meters (16,690 ft) called Pareshaya Gyab and starting the climb between 2 and 3 am. Another popular option is to ascend to High Camp at around 5,600 meters (18,400 ft) to reduce the amount of effort and time needed for summit day. However, proper water supply and worries about sleeping at a higher elevation may dictate starting from base camp. Base camp to high camp is basically a hike but just above high camp, some rocky steps require moderate scrambling and up through a broad open gully. At the top of the gully, glacier travel begins and proceeds up to a steep snow and ice slope. From here, fixed ropes will be set up by our mountain guide for the laborious ascent of almost 100 meters to the summit ridge. The climb to the summit is somewhat difficult due to steep climbing. On top, while Mount Everest is a mere ten kilometers away to the north, the view will be blocked by the massive wall of Lhotse, towering 2,300 m (7,500 ft) above the summit. 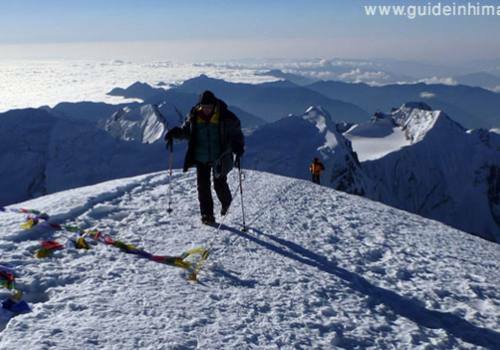 But it still provides an exhilarating mountaineering experience to the beginner and expert alike plus breath taking view other neighboring peaks and spring and autumn offers best weather for the expedition. No technical mountaineering experience is necessary to climb Island Peak, simply a high level of fitness the desire to push your limits. Our Guide in Himalaya standard itinerary first follows Everest Base Camp Trek or Everest in Hillary’s Footsteps Trek. But it always is flexible to that can be changed as per your choice and requirements. Our complete package price offers expert guide and excellent services. Reception upon your arrival at the Tribhuvan intl. airport our representative welcomes you and assists to transfer in your hotel in Kathmandu. After time to get re-energized, evening you´ll meet and transfer for welcome dinner in one of the typical Nepalese restaurant in the heart of Kathmandu and briefing about your trip and overnight at Hotel. Early morning we fly to the tiny Lukla airstrip from KTM, a scenic flight of 35 minutes; you will have time to stroll around, while the guide sort and divide the load baggage to be carried by porters. Guide will manage the lunch place depending on the time of arrival at Lukla. We then take an easy walk to Manju village, Rest of time for walk around for local knowledge. after having breakfast we will continue up the banks of the Dudh Kosi, crossing it twice by small suspension bridges. Then cross another suspension bridge, entrance gate of the Sagarmatha National Park. After walking up about 5 hrs we will reach to Namche Bazar, a prosperous trading town and the capital of the Khumbu Region. Stay there overnight. A rest day in Namche Bazaar resting and allowing our body to get acclimatized at height of (3,440m/11,283ft). You have full day leisure or visit Everest View Point hotel for wonderful panoramic view or promenade around the market, if Saturday can be seen many people in Saturday market for shopping to fulfill their daily needs and only one shopping market in the surrounding areas. Also you can visit Sherpa Museum as well a great place to learn Sherpa culture and history of mountaineering and back to hotel for overnight. We start our trek with pleasant walk through the forest with magnificent view of mountains. The great view of the world’s highest peaks Mt.Everest, Nuptse, Lhotse, Ama Dablam, Thamserku, Kwangdepeakss. The trail leads uphill through the forested path and the hardly walk to get to Tengboche. One of the most beautiful places in the Himalaya with majestic Tengboche Monastery, the large field with campsite and lodges beneath the towering beautiful peak Ama Dablam ans Thamserku. Today start our trek with easy walk and descend through a forest of birch, fir, juniper and rhododendron and coming to lovely spot at Deboche 3,650m with magnificent views and the path is gradual up to the Pangboche village, from here onwards the lush vegetation and tree lines vanishes. Our further walk up to the ridge can be seen the Pheriche valley and continuing descend to the river will reach at Pheriche but this place is most windy valley so we plan to stay in Dingboche. Today we rest for acclimatization at Pheriche valley, you may have full day rest or there are some places where you can hike for a day up to the Nangkartshang Peak (5,050 m) from where you can see the breath taking views of High Mountain including, Towering Mt. Lhotse, Amadablam, Mt. Makalu, Island peak and many more. Today the trail diverts towards north-west, the path is flat for an hour and gradual up an hour after a pleasant walk through the meadow will reach at Thukla from where you can view Mt. Pumori and other peaks west of Everest. Thukla is the good place for a few minutes break after the strenuous climb and here you can also see a number of memorial of the unlucky climbers monuments, who died in expeditions around the mountain of this region. Our trek continues to the Lobuche an hour for overnight. After breakfast we continue our trek to Gorekshep in a windy and rocky path with the wonderful view of Mt. Pumori, Mt. Nuptse and other magnificent peaks. After check in at lodge & lunch, our adventure continues towards Everest Base Camp and to the Khumbu Ice-fall. The trail passes through over rocky dunes and moraine and streams, till you reach the base camp. In Everest Base Camp the climbers gather for summiting Everest during the high expedition season. We explore base camp and its surroundings glacier and return back to Gorekshep for overnight. Our Guide will arrange time for this morning to start early hike up to Kala Pathar for the most wonderful sunrise views of the Everest. It takes about 2 hours to reach this hill top (the famous view point). This small peak offers the best views of Mt. Everest, Nuptse, Pumori and Ama Dablam along with the entire mountain views of Khumbu Himalayan range. Being here for some hours, we walk down to Gorekshep, breakfast and continue head down to Dingboche. We have a very short day and after breakfast we head further eastern side to 2-3 hrs gentle uphill to Chhukung, which is a hidden valley near the base of Island peak. 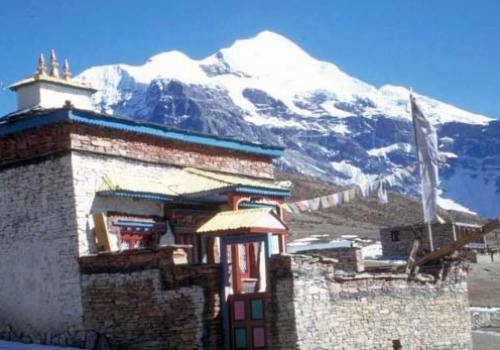 We´ll have full day rest at Chhukung and last place to prepare for camping and climbing gear, overnight at Hotel. Today, we head further on to the steep way climbing southern part then turning east to the main line of the valley. Continue short pleasant walking along a streamside leads to the big -rock. The route to the Amphu Lapcha lies to the southeast. A crisis cross route through the Imja and Lhotse glacier moraines leads to a wide valley flanking of Island peak. 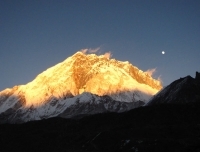 We´ll reach at Island peak base camp and overnight at tented camp. After breakfast and packed camping stuff, we´ll head on to the High camp from where we start our climb. As you climb the hill, you will see that the slope narrows and the path enter a steep rock channel nearby where we´ll overnight at camp. Early morning through the rock gully we start our climb. This is not difficult but there are several short rock steps to climb before you emerge on the right side of the gully. The route follows a ridgeline, which leads to an exhilarating and exposed traverse onto the snout of the summit glacier. 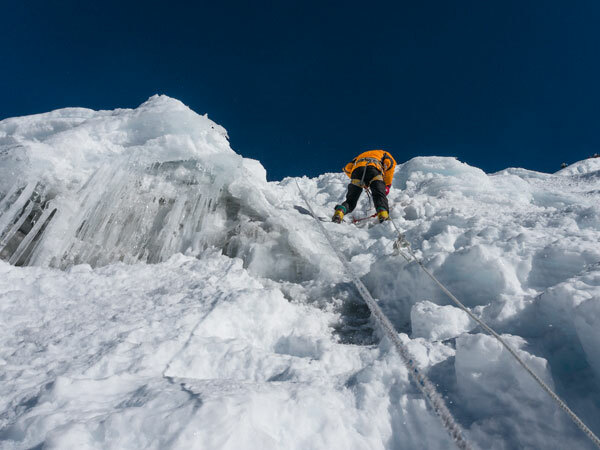 You will need to rope up for the glacier as it contains several crevasses but it leads without difficulty, to a 100m/330ft snow and ice slope (40-45 Degree) on which the guides will fix a rope. From the top of this slope, 3 rope lengths along a sharp summit ridge lead to the top. 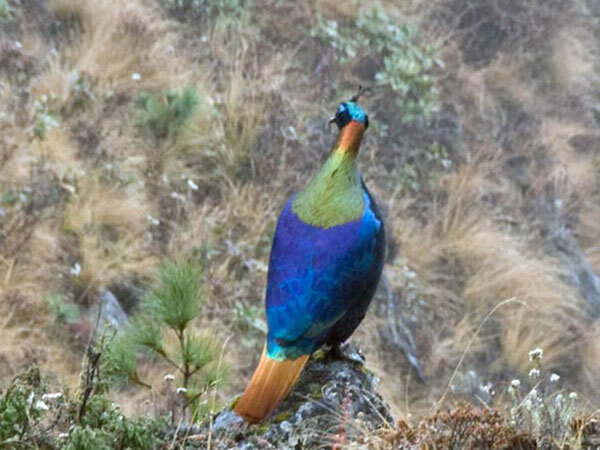 You can enjoy with success and brave to get a summit and after some picture taking of scenic view will descend all the way to Chhukung for overnight at teahouse. Trek down to Dingboche and to Namche via Tengboche. The trail leads down hill through the forested path of silver fir, blue pines, rhododendron and some few magnolia and birch trees and with a great memories and after crossing the suspension bridge over the Dudh Koshi river trek onwards to the Sanasa and re-track to Namche bazzar for the overnight stay. After a long trekking trip today we´ll have long and last day trek back to Lukla. We trek back with enjoying the lush green scenery around and passing through the incredible mountain scenery and local Sherpa village. After your arrival at Lukla you have time to stroll around the areas and guide will re-confirm your flight ticket and enjoy the last celebrate dinner with your crew member. At around 08:00AM fly back to Kathmandu our guide transfer you to your hotel. You may have time to relax after long journey and take back your breath and rest at your hotel with ending your Himalayan trip with us. All international and domestic airport shuttles. 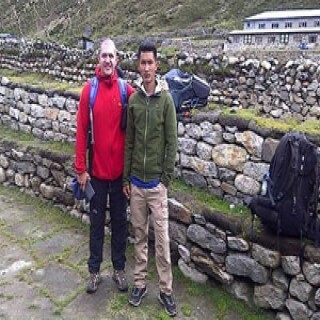 An experienced registered English speaking local Sherpa trekking guide. Climbing Sherpa guide for Island Peak climbing. 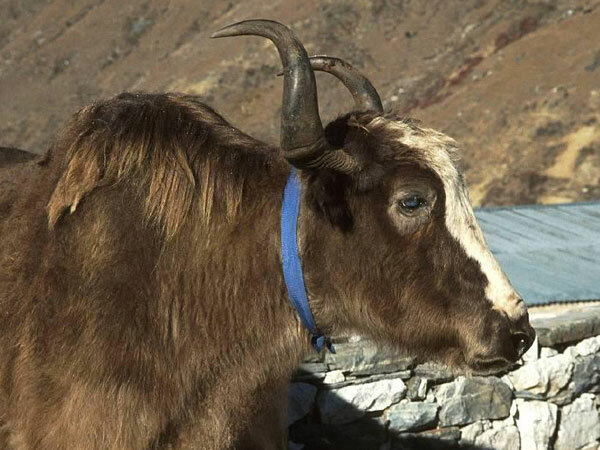 An assistant trekking guide if the group size is above 6 people. One sharing porter between trekkers to carry your main trekking pack. All meals: 15 Breakfasts, 15 Lunches, 15 Dinners during the trip. All the camping gear and necessities for two night camping at Island Peak Base Camp. Lukla round flight cost USD 360 per person. 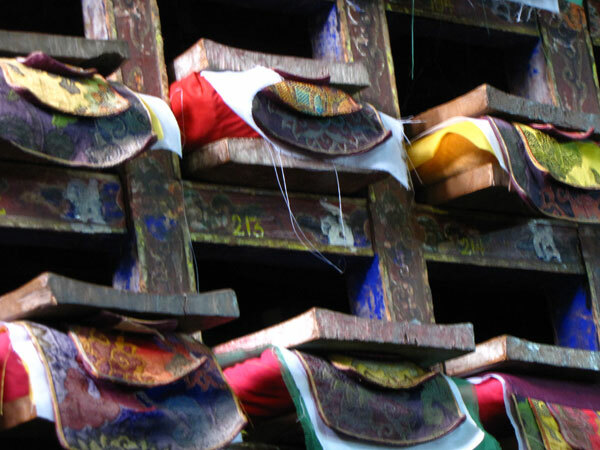 Kathmandu-Lukla-Kathmandu flight of your guide. Group climbing gear such as fixed rope, ice/snow bar, ice axe etc. Trekking lodge accommodation during the trip. 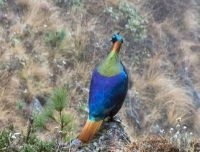 Food, accommodation and day wage of your guide and porters. Salary, Accommodation and food for your guide and porters. Insurance and gear for climbing/trekking guide and porters. Government tax, vat and Office service charge. Hotel, sightseeing tour and food in Kathmandu. Bills and beverages such as coke, fanta, mineral water. Internet, phone calls and laundry service. The trekking was perfect with good people on the way to there and back. I can just propose for everyone who wants to find the peace in the soul and at the mean time to find some good adventures. My guide Nurbu Sherpa (hired in Lukla through Wilderness Excursion) was a very kind person. He speaks very well English, young, strong and already has all the knowledge which is necessary to achieve your goals. I would like to say many thanks for Wilderness Excursion for this wonderful trip, and looking forward for the next year journey!